On Christmas this year, I received a beautiful Gretsch G5420T in a stunning orange finish, and I couldn't be happier. Since I have an unhealthy love for guitars and always need more, I'd like to ask what guitars/basses/drums/pan flutes you own. Firstly, it looks and acts fairly similar to the Gretsch so I don't know if the lack of variety is worth it. Secondly - is it good for lead? The Gretsch is best suited to rhythm, IMO, as its twangy, tight strings don't bend very well (and I love me some string bends for my obscenely long solos) and it sounds best with its absolutely stunning and twangy clean tone (although that might be because the amps I have only really have two modes, inaudible clean and ear-killing metal overdrive and no middle ground so I don't really have full distortion potential). Whilst I love the Gretsch's sound, I feel it isn't really best suited for my lead stuff; I could use some more comfortable, bendable lighter-gauge strings but I've heard they don't work too well with a Bigsby and will probably remove some of the sharp twang. So that's where the Casino comes in. I love the feedback of it since psych-rock is my forte and it works extremely well with it, but I've heard the Epi isn't great for lead (even though the stuff on Revolver tells me otherwise). Also it might make me look a bit of a Beatles-obsessed tryhard (*cough*LiamGallagher*cough*). But I digress - should I go with the samey, uncertain (but bright and beautiful) Epiphone Casino or just play it safe and get an overused, slightly-boring but assured solo-quality Strat? Either way, I'm going to a guitar shop on my birthday but it's really awkward trying stuff out in a shop. The only guitar I got is an old steel string acoustic guitar with Eterna on it. I've got a 1980's Squier Strat. Nothing special. Pictured below. I've also got a Squier acoustic guitar from the early 2000's that I got when I was ten. I haven't played it in years because it's kid-sized and I don't know where it is. I've also got an Ibanez electric bass from the late 2000's like the one pictured below (NOTE: the one pictured below is not mine, but it's the same model and color as mine). I've also got a Casio keyboard from the 1990's. I have a drumkit from the 1970's or 1980's (even though I can't really play drums), but I don't remember the maker. I think it's Pearl. @MrMoonlight Just wanna know, for how long you've been playing guitar ? Since the 23rd of May this year. I've been playing guitar for nearly twelve years. Because I'm twenty-two, that's more than half the time that I've been alive. @MrMoonlight I recommend a Fender Strat with light gauge strings. Versatile and great for lead work. Just put some Ernie Ball .9's on my Strat because that's what Clapton used with Cream, but rhythm doesn't sound too good so far. They aren't broken in yet though so don't want to judge them there yet. Great for soloing. For you I'd suggest 10 or 11 gauge. My first real guitar was a crappy old Eterna acoustic (which I never heard of anywhere else until now, @Starr Shine?) which was taken with me everywhere for a while. A year or two ago I received a beautiful blue R.W. Jameson electric/acoustic guitar as a gift. I had a Fender Tim Armstrong Hellcat 12-String Guitar that I just sold for a Vox wah pedal and a uke. My new little red Kohala uke! Lastly but not leastly: A RadioShack keyboard that was my grandmothers. I have a few harmonicas around somewhere too. That was probably my first real instrument although I didn't really learn it right away. Don't have any pics on me right now unfortunately, will post some another time! And I have a Fender Acoustic plus a couple harmonicas. 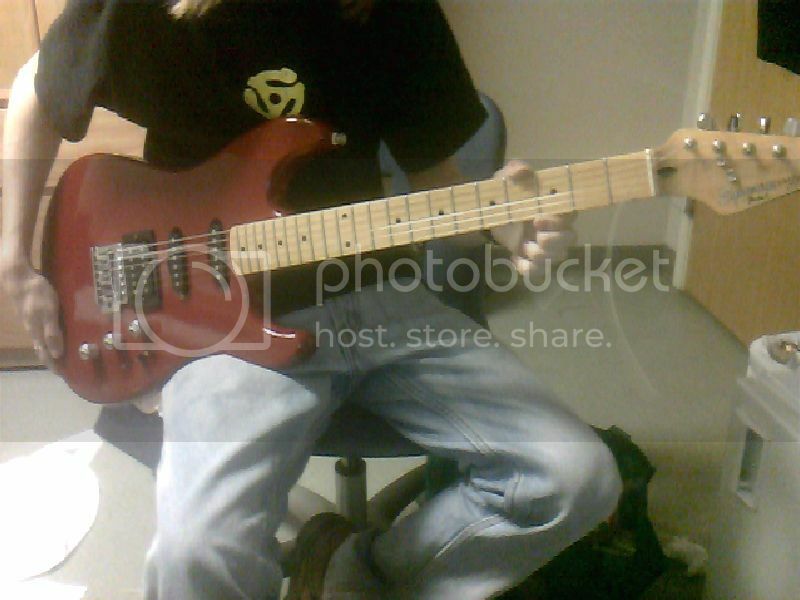 Also have another Squier Strat (Standard series, made in Indonesia), that I had my father paint red. No photo, but, for your imagination, picture a cheap Strat with a darker red with metal flake. Those are my main guitars. I have a few more. Hoping for an upgrade to an American-made Strat, a Rickenbacker 325, or a Taylor 314ce. GIn case some of you guitar fans don't check the "in My Life" thread, I thought you might like this guitar I saw in the Memphis Rock 'n' Soul Museum. A very early Rickenbacker electric guitar. Here are a few pictures from the Gibson Guitar factory in Memphis. You can't take pictures in the factory itself. Today was a work day for the factory workers. It was really neat to see them in action making the guitars. Suddenly, Ahhh Girl seems so much cooler now. Just gotta love those left-handed Les Pauls. and later, they made stuff like these!! As you may know, i play guitar and can do so pretty well but i'd like to know about you guys. Need more than three options, but I guess "wish I could" is closest to my ability. I'm pretty weak rhythmically and only know the basic open chords plus the most rudimentary barre-ing. Basically I like to fake my way through ancient hard rock and metal songs, especially like 1969-1972 stuff. Back when metal was more punk than punk. I like big Strats and i cannot lie, no other Fender can deny, when a guy comes in with a vintage Fender Strat and plays you Nowhere Man you get owned. 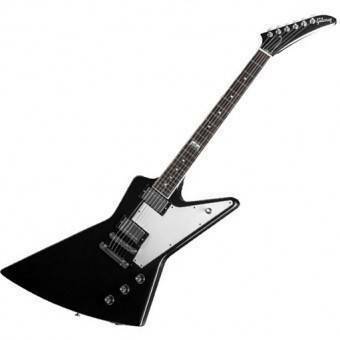 Anyways, i think this thread needs a list of top 10 electric guitar models. You forgot genres for the SG, @Dark Overlord: reggae/ska. Historically SG with P90's (Bob Marley had one) but any SG can do reggae just as nicely as a Strat, perhaps more. It can probably do funk ok but I concede the chimeier Strat has the edge there. It can be a bit tricky with humbuckers because they're pretty versatile. And did you know about the PRS McCarty? At least one person I know uses it for metal.